I want to thank my friend Valynne for making this salad at a barbecue I went to a few Saturday’s ago. I promptly made it at home the next day. It’s just a few simple ingredients, but don’t let that fool you, for it is delicious. I enjoyed it over a few days as Jeremy was traveling. It’s great as a side salad or add any number of veggies laying around to make it a satisfying meal. 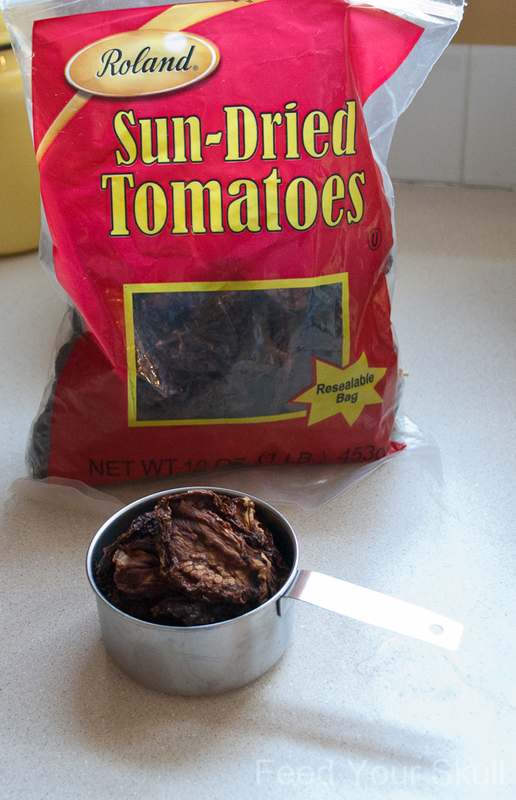 I used these Roland sun dried tomatoes that I buy in bulk from Amazon. You simply soak them before incorporating them in recipes. They are so good! My last order was in December of 2011 and I still have a bag and a half left. They keep great in the fridge or pantry. You can also further dehydrate them and then grind them in a high-speed blender or food processor to make tomato powder. They plump up nicely and are the perfect addition to a summer salad. I don’t buy pasta often so I’m always surprised to find new varieties that are exciting to try. 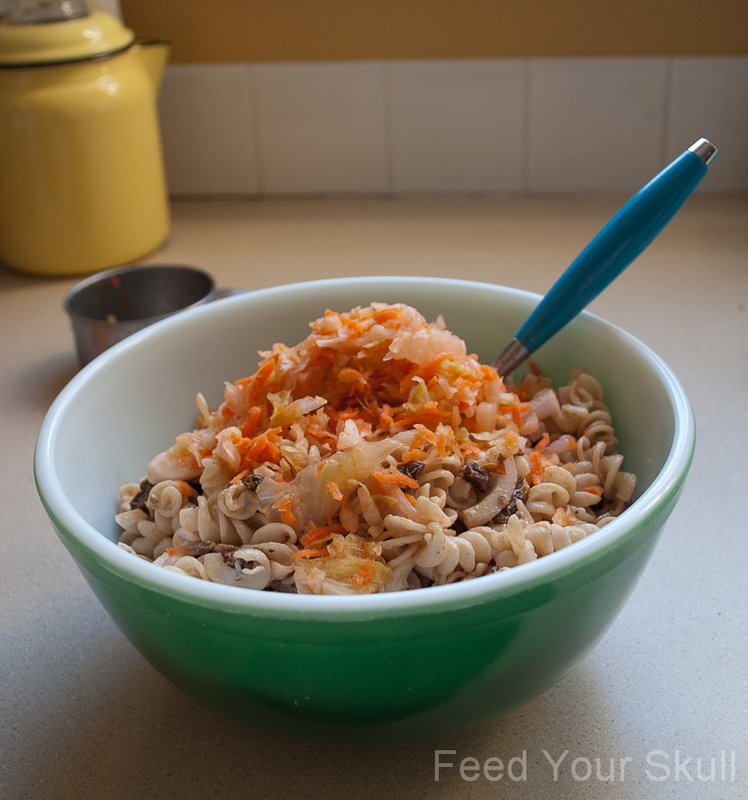 I’ve tried Trader Joe’s brown rice pasta in the past and it is just okay. They stick together and I don’t really care for the taste. 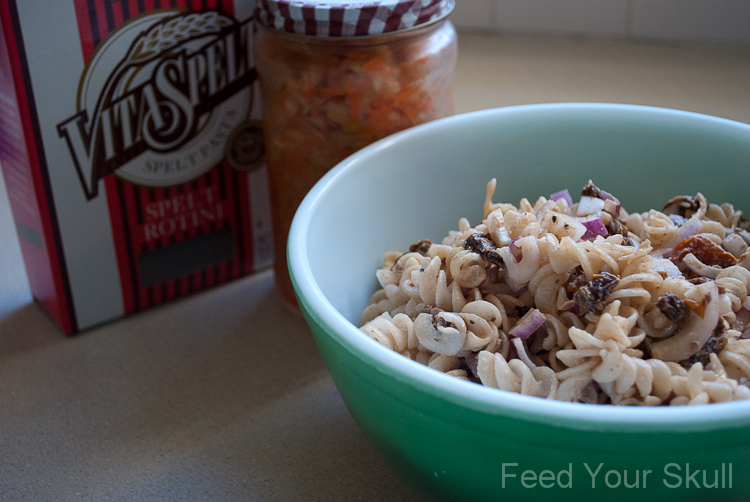 Spelt is nice alternative to wheat, which although I can ‘tolerate’, I often find I feel less bloated if I use alternatives like shredded zucchini or even these spelt rotini. They have a nice familiar flavor too. Got to find a way to sneak in homemade sauerkraut too. Boil the pasta according to package instructions and drain the pasta using a slotted spoon to reserve the hot water for soaking the sun-dried tomatoes. 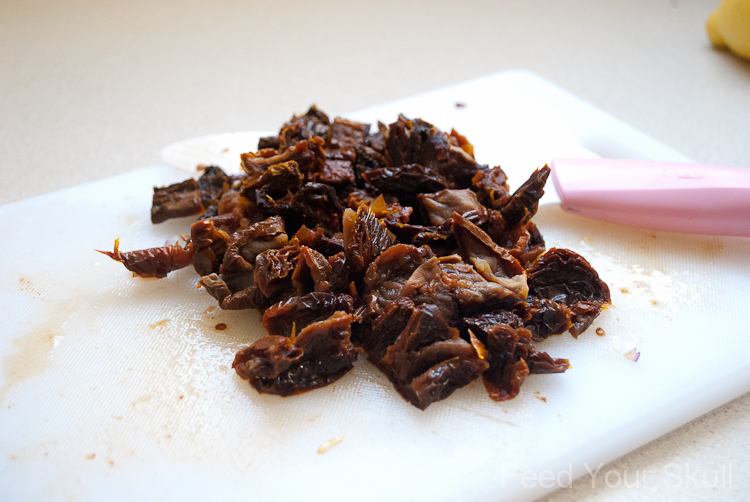 Soak the sun-dried tomatoes for 15-30 minutes depending on how dry they are. You can do this ahead of time too. While the tomatoes are soaking, combine the cooked pasta, veganaise, red onion, sauerkraut, and salt/pepper in a large bowl, mixing well. When tomatoes are done, drain the water and chop before adding it to the salad. Chill for a few hours if desired. 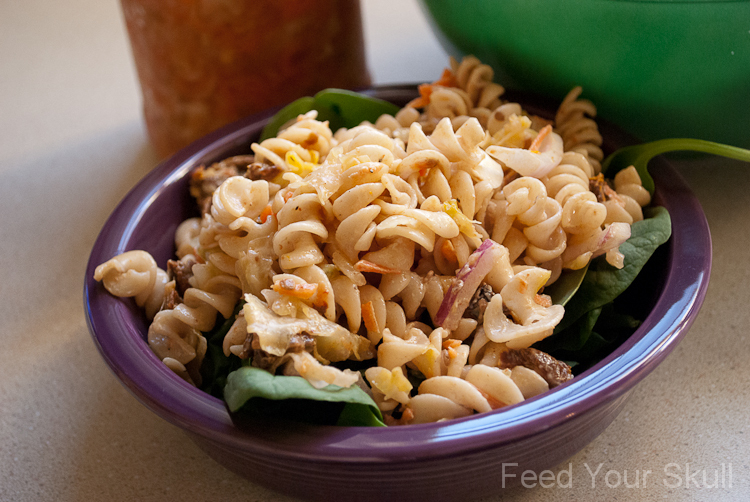 What is your favorite simple summer pasta salad?